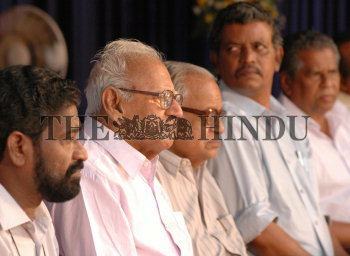 Caption : Kochi: Former Supreme Court judge and member of first elected government V.R. Krishna Iyer along with Minister for Fisheries S. Sarma; Minister for PWD T.U. Kuruvilla; K. Chandran Pillai, MP; and CPI(M) idealogue P. Govinda Pillai, at the 50th anniversary celebrations of the E.M.S. Namboodiripad Government here on May 02, 2007. Photo: H_Vibhu. 02/05/07.